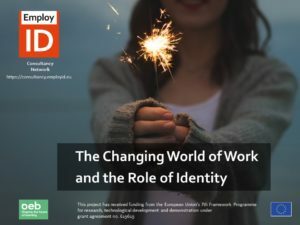 The EMPLOYID approach recognises public administration systems are facing fundamental challenges to the delivery of efficient and effective services and there is a need to change their strategies to combat high unemployment, demographic change in increasingly uncertain and dynamic labour markets. This does not only require developing new professional skills related to new tasks, but poses for more profound developmental challenges for staff members. Three of these changes relate to (i) understanding the changing world of work; (ii) a ‘turn’ towards coaching; and (iii) the increased importance of relations with employers. Practitioners and managers need to learn new ways of working, with a major challenge being to enhance the power of collaborative (peer) learning in order to support staff in accomplishing their goals. All these changes are linked to transforming professional identity, which requires learning on a deeper level that is often neglected by continuing professional development strategies.  Social learning programmes as a way of engaging learners with new topics such as labour market intelligence/information (LMI), other perspectives, and conversations around this. I’m now part of an EMPLOYID Consultancy Network, so watch this space for regular updates on how EMPLOYID is journeying into a new phase.